His many friends and social media supporters might be forgiven for not knowing the cause of Antron’s death, given it has not been mentioned anywhere in the avalanche of remembrances online or in the announcements of his passing by the HIV community groups and media outlets with which Antron was involved. How is it, then, that a longtime HIV activist could die from AIDS without the word being spoken? Someone who appeared in a national CDC campaign (“Let’s Stop HIV Together”), who wrote poetry about living with HIV and was an active member of The Evolution Project, Atlanta’s HIV prevention program for young gay black men? Part of the answer is that AIDS is a confusing diagnosis. AIDS is a syndrome that destroys the immune system and leaves someone vulnerable to deadly conditions that a healthy immune system can fight. So, technically, the specific cause of death is never AIDS itself (which is why obituaries will say someone died of “AIDS related complications”). The cause might be pneumocystis pneumonia, for instance, a deadly lung infection common among AIDS patients. In Antron’s case, he developed Kaposi sarcoma, a dangerous cancer that spread from his skin to his other organs during a month-long hospital stay before his death. AIDS caused Antron’s cancer. 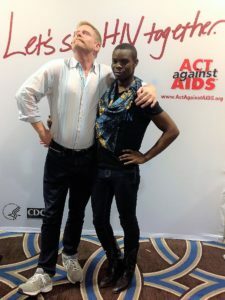 It can also be tempting to hide the cause of death in a world of HIV stigma and shame — two things Antron fought against. In obituaries, dying from the AIDS complication of pneumocystis pneumonia is often translated to, well, regular pneumonia. Antron’s death has been reported as cancer, which ignores the fact it was AIDS-related Karposi sarcoma. When “family wishes” and “privacy” enter the equation, the word “AIDS” rarely makes the final cut. Amazing, really, that this remains the case nearly two generations after the epidemic began. Antron was a hero and a source of amazement to me. When I met him in 2009, he walked into my home to film the first in a video series known as “The Real Poz Guys of Atlanta.” He was the youngest of a group of gay men living with HIV and we all loved him at first sight. He was sweet, flirty, honest, wounded, and gloriously at home in his vibrant black skin. He was also completely transparent about his diagnosis. I don’t believe for a moment that Antron would want his death from AIDS to remain a secret. He wrote often about the social pressures of living with HIV but he was never, ever ashamed of himself or his circumstance. In one of his last social media postings from the hospital, he lashed out at his community for using him as a target of gossip instead of ministering to him. Antron said he had cancer in that posting as a way, I believe, of appeasing those who didn’t really care about him. It was a convenient truth for Antron at the time, but not the real one. And if we have learned anything in 2017, it is that the truth matters. Antron just didn’t live long enough to tell it. Those of us who knew and loved Antron must call out AIDS and its destructive presence in our community. Otherwise, we are ignoring the very thing that killed our friend. It’s as if Antron was shot to death and no one will admit that the weapon was a gun.